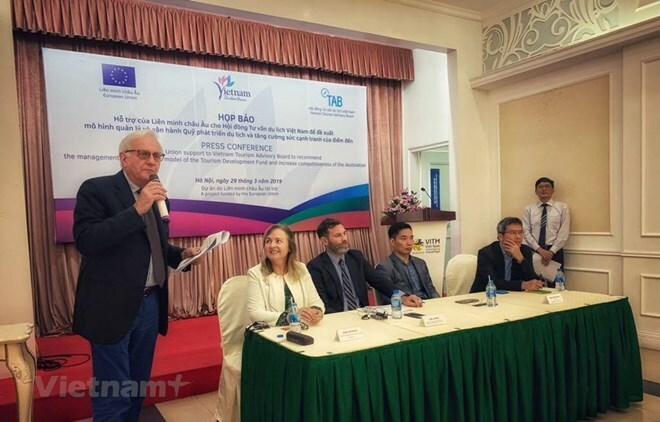 Hanoi (VNA) – The European Union’s technical assistance project, started from February 2019, will help Vietnam strengthen competiveness of its destinations and gain a better position in the changing international tourism market, according to the Vietnam Tourism Advisory Board (TAB). TAB convened a press conference on March 29 informing the EU’s assistance, which will go via the tourism development fund. In the next 12 months, EU experts will work with Vietnamese partners and the TAB on the building of the competitiveness index of destinations, which is necessary for the sustainable development of the Vietnamese tourism sector. The competitiveness index will be piloted in Vietnam’s five leading destinations, including Hanoi, Ha Long Bay, Hue city, Hoi An city, and Ho Chi Minh City. According to the United Nations World Tourism Organisation (UNWTO), Vietnam ranked 67 of the 136 countries in terms of travel and tourism competitiveness index in 2017, thank to its natural resources, culture, and competitive price. The competitiveness index will serve as a comparative tool stimulating healthy competitiveness and encouraging service and environment improvements in destinations. It is expected to create changes first in local competitiveness and then national competitiveness. In February, 2019, the establishment a state-owned tourism development fund got the Prime Minister’s approval. Operating as a single-member limited liability company under the Ministry of Culture, Sports, and Tourism, it will be used for building plans, allocating funding for tourism promotion activities, and supporting tourism growth in line with the law as well as national strategy and development planning. The fund’s 300-billion-VND (12.9 million USD) charter capital is set to be financed by the State budget in the first three years following its establishment. The State budget will also grant it an annual sum to cover operational costs. The sum will be sourced from the total annual budget collection from tourism entrance fees (5 percent) as well as visa and entry-exit services for foreigners (10 percent). Early in February, the PM has approved a project to restructure the tourism sector to turn it into a spearhead economic sector for the country and make Vietnam one of the nations with the most developed tourism sector in Southeast Asia. The project sets a target of 45 billion USD in tourism revenue by 2025, with exports through tourism reaching 27 billion USD.